This crispy protein bar differentiates itself due to its exceptional taste, high 38% protein content and very low sugar content. INGREDIENTS: Milk chocolate 30% (sweetener E965, cocoa butter, whole milk powder, cocoa mass, emulsifier E322 (contains soy), flavour), milk protein, soy protein, humectant E422, collagen peptides, sweeteners E965/E955, oligofructose, bulking agent E1200, cocoa butter, palm fat, tapioca starch, whole milk powder, low fat cocoa powder, emulsifier E322 (contains soy), flavour, salt, colour E150a. 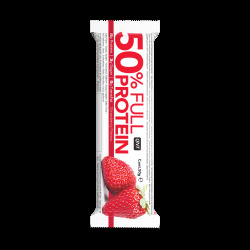 • Up to 38% high quality proteins per bar! • Very low sugar: only 2,2 g!